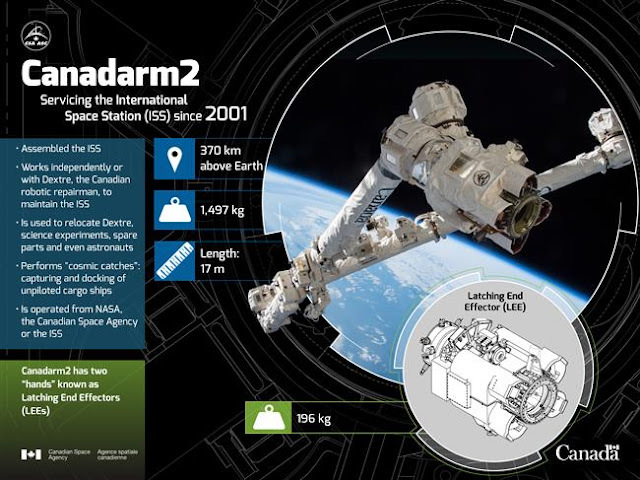 Canadarm2 is a 17 meter-long robotic arm that assembled the International Space Station (ISS) while in space. It is routinely used to move supplies, equipment and even astronauts. As well as supporting the Station's maintenance and upkeep, it is responsible for performing "cosmic catches," the capturing and docking of unpiloted spacecraft that carry everything from science payloads to necessities for the 6-person crew on board the ISS.